This past Sunday, October 23, 2016, Haiti Cultural Exchange collaborated with Festival Haiti en Folie and hosted a conference and book signing for authors Michel Soukar and Rodney Saint-Eloi at Brooklyn College. Fabienne Colas, founder of Haiti en Folie and Carèl Pèdre, radio host of Chokarella in Haiti gave a warm welcome to the attendees after which, the writer and poet Michèle Marcelin Voltaire moderated the conversation between the two guest speakers. Michel Soukar, historian and journalist based in Port-au-Prince spoke about his career and how his exile from Haiti allowed him to take a step back, as an activist, to focus on the history of the country. Learning about the complex history of Haiti encouraged him to communicate political and societal change in compelling storytelling. Soukar’s bibliography includes “Cora Geffrard”, which recounts the life and death of president Fabre Geffrard’s daughter who was killed at a young age and “La Prison des Jours”, which follows his main character, Antoine Pierre Paul’s insurgence against the US army during the American occupation of Haiti. In December, Soukar will be part of a conference in Haiti highlighting this military occupation, as a difficult period with an ongoing impact. Rodney Saint-Eloi, writer and editor based in Montreal spoke about the importance of memory for the Haitian people. In the presentation of his newly published novel “Passion Haiti”, he mentions that memory is important to preserve for it is by knowing our past that we can move forward with lessons learned. As an example, he mentioned that his recent novel gave hope to a reader who felt hopeless for the Southern cities of Haiti post-hurricane Matthew. By reading about the author’s native city of Cavaillon, the reader understood that this city would prevail, for there was a lot of history that could not be erased by a hurricane. As editors and great promoters of Haitian literature, Michel Soukar and Rodney Saint-Eloi also took the time to pay homage to classic Haitian writers like René Dépestre, Marie-Vieux Chauvet and Jacques Roumain. They also highlighted the works of a growing number of women writers, as well as that of poets who publish in Creole. The attendance was multi-generational and the questions covered many aspects of the literary scene of Haiti from budding writers trying to make a mark through their participation in fairs and literary events, to scholars who are concerned about the future of literature in Haiti and the access to published work by a wider Haitian audience, via education. The event ended with a long line of guests eager to have their questions answered as they got their newly purchased books signed by the authors. Haiti Cultural Exchange was pleased to partner with Fabienne Colas and Haiti En Folie and look forward to continuing to partner with likeminded organizations to bring Haitian culture to the forefront of New York’s rich cultural landscape. by Nathalie Jolivert, Communications and Outreach Coordinator at HCX. 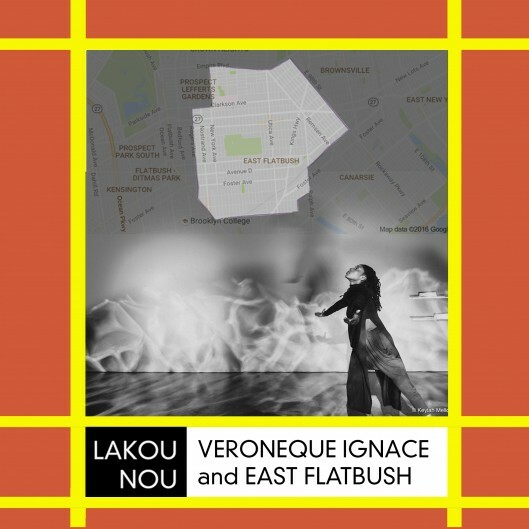 Lakou NOU is Haiti Cultural Exchange’s newest Artist in Residency program providing opportunities for artists to work in Brooklyn communities that are home to generations of Haitians and Haitian-Americans. 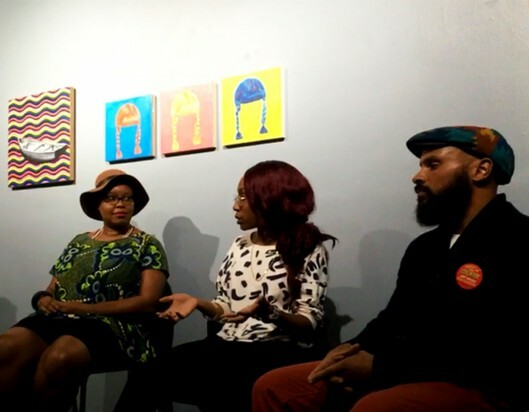 The first four artists to participate in this program are true community activists who will be working in the neighborhoods of Crown Heights, Flatbush, East Flatbush and Canarsie. 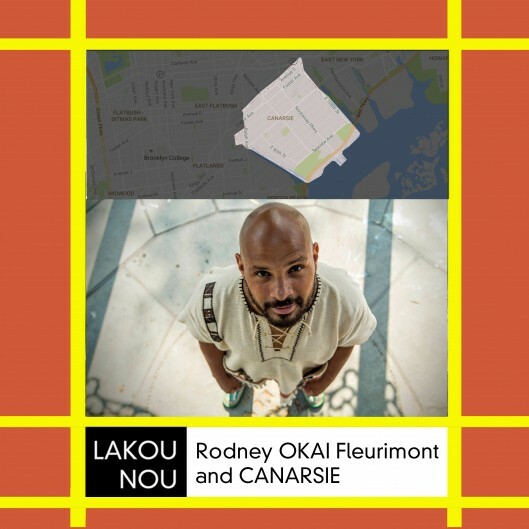 Their projects deal with urbanism, place-making, community-building, public health, and empowerment at a time in US history when the Afro-Caribbean people of Brooklyn need it most. HCX hosted its signature Ann Pale Café Conversation panel with the first cohort of Lakou NOU residents: Sabine Blaizin, Veroneque Ignace, & Okai Fleurimont. (Sherley Davilmar was unable to be present). Sabine Blaizin, a New York based DJ who spins Afro-Soul, combines sounds of the African and Afro-Caribbean diaspora. In her project based in Crown Heights, Blaizin will create a soundscape with stories she will collect from Haitian members in the community affected by gentrification. To collect those stories, Blaizin is very proactive in connecting with Crown Heights community leaders and attending neighborhood meetings relevant to her subject. On October 26th, she will be holding interviews at our office in Crown Heights with volunteer residents. Their stories will be recorded by StoryCorps and archived in the American Folklife Center of the Library of Congress. Blaizin has performed with DJs in various cities in the US, Canada, Dakar, Mexico, Cuba and Haiti. In answering how it feels like to travel to different countries and coming back to the US with new material, she explains that she reaches a different level of connection with her crowd. 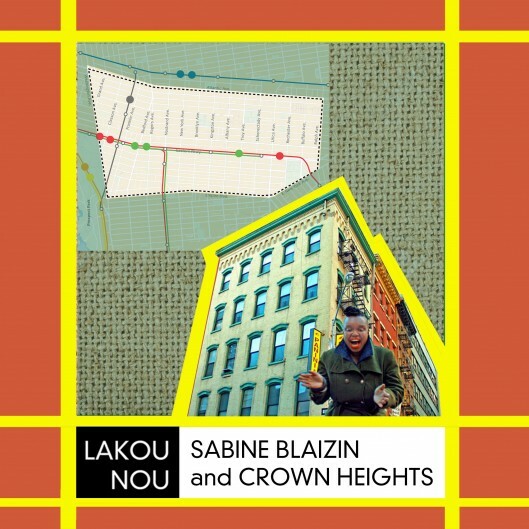 Listening to her music mixing conversations, deep reflections and words of wisdom, one can already imagine how inspiring and challenging it may be for Blaizin to piece together sounds of grief, displacement, nostalgia and disappointment in Crown Heights. The feelings that are attached with the “Haitian flight” in Crown Heights can be assimilated to all the forced migrations people of black heritage experience. Gentrification is an ongoing occurrence in Crown Heights. It is bittersweet to foresee that the residents’ experience is ready to be archived for the memory of future generations. Blaizin’s project also brings an opportunity for those residents to reflect on their situation with an approach that might reveal new depths in their understanding of what gentrification means in their lives. Véronèque Ignace is a dancer and public-health professional who wants to heal through the power of dance. This has been an important goal for her since working on her thesis at Williams College. In a powerful video introduction of her thesis, she explains that the experience of Black students studying in predominantly white institutions can be traumatic and should be taken into account in their academic performance. The result is a dissertation and choreography in which her dancers interact with the audience and make them face this issue with movement. How does her experience as a dancer and academician at Williams differ from her role as a healer in East Flatbush? “In East Flatbush my work is not a show” she responds. In East Flatbush, Ignace creates a platform and outlet for the youth to deal with emotions that are not always addressed. It is an opportunity for her to truly practice skills of dance therapy and respond to the youth’s reaction to violence in their neighborhood. “Some of them are afraid to leave their house” Ignace explains. The title to Veroneque’s project is “#Trending” and she encourages the young Haitian-Americans of East Flatbush to express their feelings about the trending deaths in the Black community – Alton Sterling and Philando Castile, more recently Keith Scott… unfortunately, the list goes on. How not to feel overwhelmed? Dealing with the growing numbers is a challenge that Ignace is willing to tackle as the youth of East Flatbush grapple with the violence they witness in their community. Rodney ‘Okai’ Fleurimont, is a percussionist and MC who is interested in the importance and benefits of a healthy diet in a musician’s life. In recent experiences traveling with his music band, he realized that, beyond the fatigue of traveling through different time-zones, the meals his colleagues consumed had a direct correlation with their performances. Okai has previously taught at PS 189 in Brownsville Brooklyn as a Ti Atis teacher via HCX and his experiences leading workshops and various other initiatives, made him realize that there is a pressing need for the youth in the Black community to think about their diet. Issues of diabetes and obesity are prominent within the youth of the Black Community. With his project in Canarsie, Okai will partner with various drummers, masters of Afro-Caribbean and West-African techniques, to teach students how to play the drums. Each session will begin with a class on exercise and diet. Okai’s goal is to inspire the Haitian-American youth to keep their passion for music alive by understanding that they need the physical strength to carry their musical instruments around and also to play for hours without collapsing. There are many other benefits in participating in Okai’s workshops. Discipline and team-work are the qualities he sees his students acquire as they learn how to play the drums. They understand that it takes great team-work and perfect coordination to carry out a nice melody. Sherley Davilmar, who will be working in the community of Flatbush was unable to make it to the Ann Pale Café Conversation. However, she shared with us the workshops that she will be hosting in the upcoming weeks for her project. They will all take place at the Brooklyn Public Library on Linden Boulevard and will cover themes of “Health Beauty and Wellness”, “Gentrification” and “Black Bodies”. From Davilmar’s energetic performances during HCX’s Selebrasyon events, one can already expect that her work will be charged with great information for future performances. The Ann Pale Café Conversation with the Lakou NOU artists was a great opportunity for us to learn about the progress of their work. Speaking to the audience was also initial research material for the artists in their projects. As interactive as their work is, it will be inspiring to see how their projects evolve in the upcoming months. Check out the Facebook Album HERE. Take a look at the calendar of upcoming programs HERE. 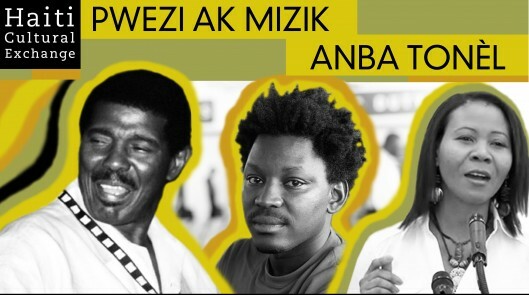 For the 6th edition of our annual literary event “Pwezi ak Mizik Anba Tonèl” we were pleased to host the legendary musician Boulo Valcourt and poets Jeanie Bogart and James Noël. Boulo Valcourt holds an important place in the Haitian music scene and culture. He participated in various music bands, including Ibo Combo and Caribbean Sextet, and is well known for his contribution to Haiti’s “twoubadou” music genre. Jeanie Bogart grew up in the Southern Haitian city of Les Cayes before moving to New York. As a Creole and French court interpreter, Bogart witnesses difficult court trials, yet her poetry is full of passion and love. James Noël, who joined us from Port-au-Prince, is a prolific poet whose career is widely celebrated. He is very active in the literary scene of Haiti and often participates in international literary events. The evening started with an open-mic for poets in the audience, which was a fitting tone for this evening filled with impromptu performances, street dancing, and community residents from our Crown Heights neighborhood. They were followed by Boulo Valcourt whose lovely guitar set the mood for James Noël and Jeanie Bogart. Noël’s touching tribute to the late Haitian drummer Léonord Fortuné ‘Azor’ and Bogart’s passionate love lyrics motivated our guests to rush and buy copies of their anthologies after the show. It felt like the perfect end-of-summer event. In the final moments, Boulo Valcourt’s nostalgic sounds for the famous song “La Pèsonn O” had the crowd chanting together with the musician as they wished farewell to the warm season. Join Haiti Cultural Exchange for Selebrasyon! 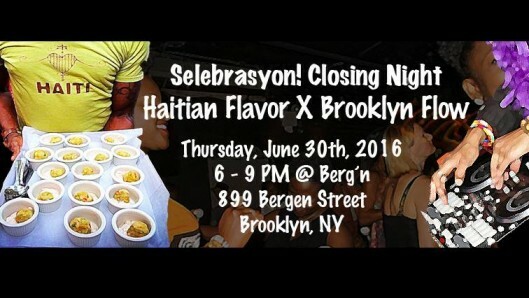 Closing Night | Haitian Flavor X Brooklyn Flow, a unique culinary experience presenting the diversity of Haitian fare to New York City. Ten food & beverage vendors will provide samples of their products, followed by two featured chefs who will serve plates of their innovative Haitian cuisine. The event will also feature live music by Val Jeanty and a dynamic afrohouse DJ set by Sabine Blaizin. This festive culinary experience is the culminating event of Selebrasyon!, New York City’s only festival dedicated to presenting the best of Haitian Arts & Culture. All proceeds from the event will go toward Haiti Cultural Exchange’s Cultural Engagement, Arts Presentation, and Artist Development programs and activities. Limited availability ticket levels are also currently on sale. 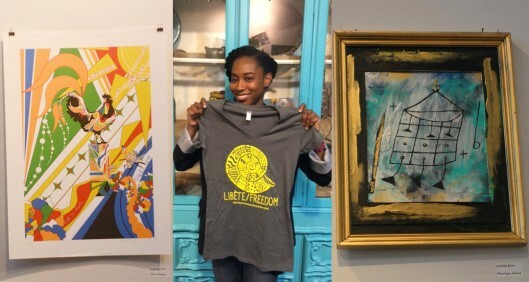 The Libete Package includes a Libete/Freedom T-shirt (pictured above), The Agronomist DVD, and a Haiti Film Fest Tote Bag along with entry to the event and drink tickets. The Artwork and Admission level includes an original artwork by a Haitian Diaspora, also with entry to the event and drink tickets. Additional artworks will be available for sale at the event. Thank you to our venue sponsor, Berg’n, the Crown Heights beer hall from the founders of Brooklyn Flea and Smorgasburg. ADMISSION: Click here to purchase tickets!